In this final part of our discussion around Sreelata Menon’s question: How can a poem be made a learning experience for the student? we take the lead from Attreyee Chatterjee’s assertion that if we are teaching a poem to an older age group, for example senior school children or undergraduate/graduate/postgraduate students, the approach has to be completely different. In this discussion, we touch upon strategies used while teaching poetry to older students, even those in college. Sumitra Gautama shares that: More than any other literary form, I find that poetry evokes ‘thoughts that often lie too deep for words’. Not every poem makes equal sense to every person, but poetry well facilitated always builds empathy. She adds: Reading a poem has the power to transform the moment, when the ground has been prepared for it. However, she does include a caveat: Yet the learning experience is a journey each student takes alone into a good poem, a landscape that she/he looks at with wonder and care. Finally, she obviates the possibility of listing strategies by concluding thus – to allow that to happen is the challenge of the teacher, and I have found that more than ideas and notions of how this can happen, it is mindful watching and a deep anchoring in the poem itself – its ‘is’ness, which the teacher needs to have worked with earlier, and which includes many things. Then each class becomes unique and appropriate. Nalini Ravel concurs, as she shares: I always made it a point not to ‘teach’ poems but to make my students experience the deep feelings, tenderness, imagery, melody, rhythm, rhyme, and aesthetics that a poem brings along. While Sumitra did not find it possible to spell out techniques, she did emphasize two things: mindful watching and a deep anchoring in the poem itself. Many of the strategies suggested by respondents in the last two parts of this discussion could, perhaps, allow this mindful watching to flower…For instance, Nalini Ravel outlined one of her favourite strategies thus: There was one more activity that students loved. I would play/sing a poem in the class and ask the students to listen to it carefully. Then, I would give them a handout of the same poem with blanks in between. The students would try to fill in the words from their memory – and then sing the poem. I would modify this activity a little for the older students and ask them to replace certain original words with their synonyms, keeping in mind the rhyme and the meter. This activity also impacted their listening and comprehension, reading and writing skills as well as improved their pronunciation and vocabulary. Nalini went on to suggest that a teacher could: Ask them questions related to the poem such as ‘If you were the flower mentioned in the poem, then what would you wish for’? or ‘how would you want to serve your country?’ or ‘do you agree with the poet when he says ——?’ etc. Nabanita Chakraborty has this to say: Teaching poetry to undergraduate and postgraduate students within a stipulated period of time has always been a challenge to me, since it requires a dynamic interaction between the teacher and the students. An effective pedagogical methodology would require the teacher to read aloud the poetry and engage the students in appreciating the formalist aspects of poetry (structure, imagery, symbol, and rhythm) before launching into a close reading of the text. Sumitra’s phrase: ‘when the ground has been prepared for it’ rings a bell here. How does Nabanita prepare the ground for this? I have seen that my students are able to relate and understand the text if I can initiate a discussion on shared cultural and literary knowledge. What does she mean by ‘cultural knowledge’? I mean the socio-political framework within which the text has been written as well as the reception of the text over the centuries. This would also include approaching the text through various theoretical methodologies/paradigms like New Criticism, Marxism, Feminism, New Historicism, Cultural Materialism and Post-Colonialism (to name a few). And what does she mean by literary knowledge? Literary knowledge means a repertoire of other poems written by the same poet or by his/her contemporary poets/authors. Having said this, however, Nabanita asserts – What fascinates me is the ability to explore new meanings and ideas in the same poem (taught to various batches) in an interactive session with students. So I would reiterate that the key word in teaching poetry is a dynamic interaction with students tapping into the resources of shared knowledge of literary, cultural, and political history. Through their strategies of getting children to set poems to tune, sing them, illustrate them, and even enact them, even teachers in our staffroom who taught poetry to younger students seemed to resonate with that last sentence above. Sunanda Ali emphasizes the power of the first impression that the poem makes on a student: I try to ensure that the students get interested in the poem at the very beginning. I read the poem first, as well as possible, trying to get across the spirit of the poem. She adds: At this point, I think, explanations are not important. Then I get responses from the students as to what their first impression of the poem is. Then I try to get a discussion going in response to what the students say. Having prepared the ground thus, she goes on to say: Once students get ‘into’ the poem, the discussion can be steered into focusing on the literary aspects of the poem. At this point, students can read the poem aloud, and hear each other read it. She adds: I think our primary focus should be on the whole poem and our emotional response to it. Once students develop a relationship with the poem, they are likely to get back to it or at least not get too bored on having to study it again. Prema Rangachary finds it a challenge ‘to break the psychological barrier of poetry. To most students, poetry is the least accessible, most frustrating and boring genre.’ She goes on to say: There is a certain mystical aura around poetry. It presumes the need for a subtle, sensitive mind to delve into its inner meanings. It is, therefore, absolutely essential to demystify the idea that while reading poetry you are supposed to find some hidden meanings, read between lines and unravel a great mystery. 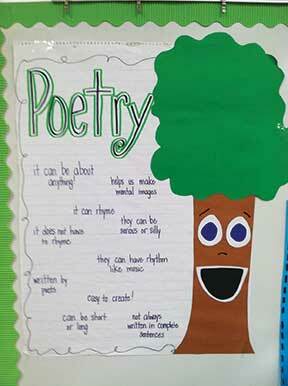 This is the first step to getting students to enjoy poetry. It is also necessary to bring their attention to the fact that their lives are surrounded by lyrics. An exercise to break the fear of poetry could be to ask students to write or discuss the lyrics of the songs that they listen to. 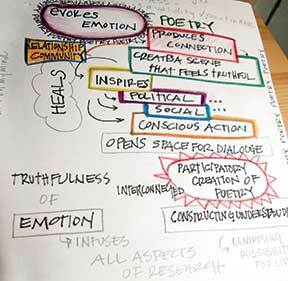 Usually, the following questions are good starting points to introduce the study of poetry: Who writes poetry? How does one write poetry? Who reads poetry? I also read the poem that I wish to teach and see whether I like it. Even as Prema points out: It is difficult to teach a poem one does not enjoy, she hastens to add: Of course, often, we don’t have a choice – since the poems are pre-chosen in a syllabus. Therefore, what does she do? 1. Understand what you read. 2. Notice details of language that are interesting or strange. 3. Explain the effect of those details. The first two are challenging to students, as they are not sure about the textual features worth noting. A list of features on the board gets students involved. The third step focuses on the effect rather than the intent of the choice. Gradually, the theory of how poems work starts to emerge. The point is to reveal that the students have discovered something real about the poem, something that is empirically “there” and “right”. This approach usually works well, as it gives the students a thrilling moment of discovery and helps animate their own later work. With this, we conclude our staffroom discussion on how a poem can be made into a learning experience for a student. We invite responses from readers to the next question that appears in the page. Ajitha Paladugu of Delhi Public School, Coimbatore has posed the following question: Going by the limitations faced by teachers – some of which are intrinsic and self-imposed, some imposed by the demands of society and others due to the lacunae and flaws in our education system itself – is the concept of holistic education a utopian dream? How do educators go beyond making students literate and skilled and launch them on the path of self- discovery leading towards self-actualization? Where do we begin in this noble endeavour to impart “education” in the real sense of the word? Send in your responses to devika@shikshangan.org (kindly note the change in email address) to join this discussion! The author is the Founder-Director of Thinking Teacher, an organization that is working towards creating a network of reflective teachers who seek each other’s views on a range of issues pertaining to teaching and learning.